The Avanti EWC1201 Wine Refrigerator boasts a black cabinet and concave glass door that makes it a stylish addition to any kitchen. With its freestanding and compact design, this wine refrigerator can fit in tight spaces while managing to hold up to 12 bottles of wine in its slide-out chrome shelves. Comments: We were excited to get this wine cooler which fit comfortably in the kitchen corner making it handy to get to. However, we received several bottles of wine from California and found to our dismay that several bottles were too big to fit in the cooler😢....now what do we do we these bottles? Comments: It's amazing, have a good size, do not make any noise, I will buy again and recommend to all my friends, I love it. Comments: Just the right size. How much energy it uses and how long it will last. 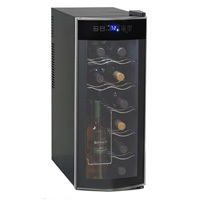 A really nice wine cooler! Comments: Works very well, very quiet, keeps things at a good temp. Fits nicely in a small area! We really like this product! Comments: Thank you Beverage Factory for making the ordering process so easy. I placed an order on Monday and had it loaded with wine on Friday! I'm real happy with the wine fridge. It's quiet, it looks great and the temperature control was easy to set up. I didn't realize it wasn't designed for built-in use until I got it here, which was my fault. I had to find a different spot to put it but with it's size it was easy to do. I would definitely recommend it for someone with a small collection just getting started.